Craftsman 675 Series Lawn Mowers have Briggs and Stratton 190-cubic centimeter displacement vertical shaft engines rated at 6.75 foot-lbs. of torque at 3,100 revolutions per minute. The 675 Series mowers are most often push-type walk-behind rotary mowers with 21-inch or 22-inch cutting decks. The manufacturer of these engines recommends the initial engine oil change after five hours of use, and after 25 hours of use thereafter. Changing this oil is a straightforward process. Pull the sparkplug wire off the sparkplug and rest it on the stub at the top of the cylinder head. Push the mower to a clean, level surface. A garage is great because wind will not deflect the oil stream. Put down a plastic sheet or bag if you are concerned about drips on the driveway or sidewalk. Loosen the oil dipstick level cap at the top of the engine, and remove the dipstick and cap assembly entirely. Get your catch container ready. It should be able to hold at least 1 qt. of liquid, with 2 qts. being better. The top should be at least 6 inches in diameter to prevent drips. 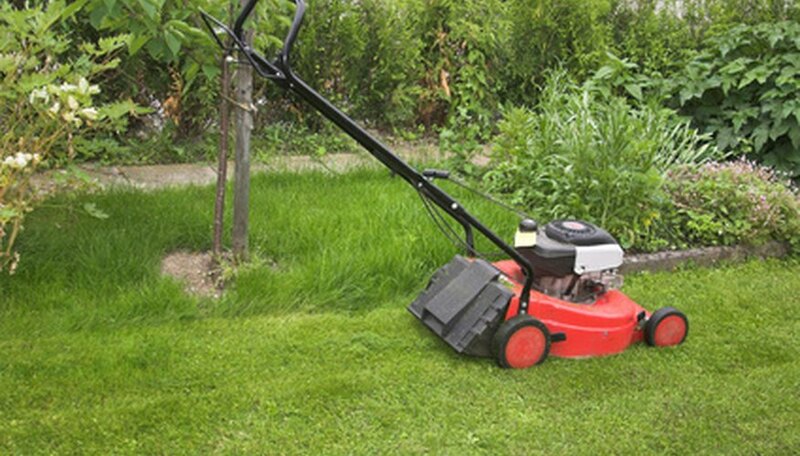 Tip the mower carefully and slowly on its side while holding the container right under the oil dipstick tube. The carburetor should be on top of the engine, and the oil dipstick/drain tube should be at the lowest point on the engine. Do not touch the oil, as it may still be hot from running the engine. Rock the mower a bit while still draining to get the oil that may be trapped in recesses in the engine. Right the mower again when the oil drip becomes irregular. Clean any run-down or drips on the mower or ground. Be careful not to allow any dirt near the fill tube entrance. Fill the engine with the 20 oz. of new oil. Use a small funnel to help channel it all into the dipstick tube. Wait a few minutes and check the oil level with the dipstick. Reconnect the sparkplug wire and start the engine to check for correct operation. There should not be any raps or tapping sounds. If it makes a strange noise, stop the engine immediately and check the oil level again. Fill as necessary. Running an engine without oil will result in its seizing, which will ruin the engine. Dispose of used oil at a recycling collection center. Always disconnect the sparkplug wire when working on a lawn mower to prevent inadvertent starts and serious injury.